Pain, Loss And Tears Come With Medal Of Honor : The Two-Way Staff Sergeant Ty Michael Carter received the nation's highest military honor. He feels privileged, but says "I would never tell any soldier or service member, 'Hey, go out and get the Medal of Honor', because of the amount of pain and loss and tears that has to be shed in order to receive it." U.S. Army Staff Sergeant Ty Michael Carter near Dahla Dam, Afghanistan in July 2012. Saying he represented "the essence of true heroism," President Obama presented Army Staff Sgt. Ty Michael Carter with the nation's highest military honors, this afternoon. "As these soldiers and families will tell you, they're a family forged in battle, and loss, and love," Obama said, according to the AP. "I would never tell any soldier or service member, 'Hey, go out and get the Medal of Honor', because of the amount of pain and loss and tears that has to be shed in order to receive it," Staff Sergeant Ty Michael Carter tells Morning Edition host Renee Montagne. 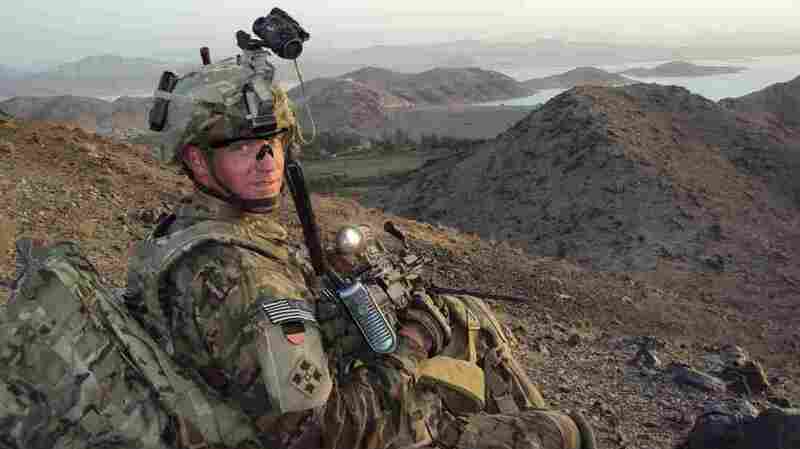 Carter, 33, is being given the nation's highest military honor for his actions during a 2009 firefight in Afghanistan. He was a specialist at the time and stationed with the Army's Black Knight Troop at Command Outpost Keating. The soldiers' location was vulnerable — a remote valley surrounded by three steep mountains. It's the type of place the military no longer posts troops in Afghanistan, in part because of what happened there on Oct. 3, 2009. Even though Taliban fighters fired at them nearly every day, Carter tells Renee it was immediately clear something much worse was happening on this day. "It was as if somebody kicked an ant hill," he says. "The bullets, the rockets, the mortars, everything, a wall of spikes — they're pointing at you." The Army says Carter killed enemy troops, resupplied ammunition to American fighters, rendered first aid and risked his own life to save an injured soldier who was pinned down by a barrage of enemy fire. "Even though this award is an awesome honor and a great privilege, in order to get such a prestigious award, you have to be in a situation where your soldiers, your family, your brothers, are suffering and dying around you. And then, you just did everything you could to save lives or prevent further loss." According to the Army, "of the 53 members of B Troop, 3rd Squadron, 61st Cavalry Regiment, who defended the position, eight soldiers were killed, and more than 25 were injured." President Obama is scheduled to bestow the medal at a 2 p.m. ET ceremony. C-SPAN is among the news outlets that will stream the event. Carter will be the fifth living recipient to be awarded the Medal of Honor for actions in Iraq or Afghanistan. "Include the Purple Heart, the Army Commendation Medal (with 4 oak leaf clusters), the Army Achievement Medal (with 2 oak leaf clusters), the Army Good Conduct Medal, the Navy/Marine Corps Good Conduct Medal, the National Defense Service Medal, the Afghanistan Campaign Medal (with two campaign stars), the Global War on Terrorism Service Medal, the Noncommissioned Officer Professional Development Ribbon (with numeral 2 device), the Army Service Ribbon, the Overseas Service Ribbon, the NATO Medal, the Combat Action Badge, the Expert Infantryman Badge, and the Air Assault Badge. He is also authorized to wear the Valorous Unit Award and the Meritorious Unit Commendation."